All Saints' Church Northampton - Lunchtime Live! 2010 ends with a bang! Lunchtime Live! 2010 ends with a bang! Over the past seven weeks, seven of the finest female organist working in Britain today have performed at our summer series of Lunchtime Live, this year entitled “The Queen of Instruments”. The series began with our Patron, Dr Jennifer Bate OBE, and our final two recitalists (pictured) brought the series to a remarkable conclusion. and Karg-Elert and, in Dr Pardee’s words, includes “…unmistakable shades of George Gershwin, as well as the ‘You-Dirty-Rat’ style of actors Edward G. Robinson and James Cagney”! But it was in Marjorie Merryman’s ‘Les Très Riches Heures’ where she excelled. 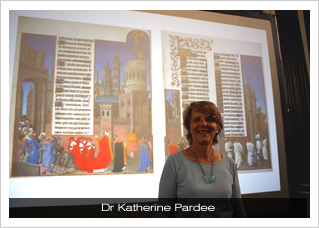 Here, our recently-installed projection system was switched from the live video feed from the console, to show the medieval illuminations upon which each movements was based on (see picture, above, of Dr Pardee in front of one of the projections). 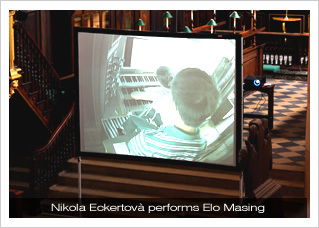 Estonian composer Elo Masing’s ‘Miniatures’ that made the greatest impact. From the rhythmic slamming of the swell box and full arm clusters (pictured left), this music explored regions of the organ very rarely heard, and it would be impossible to reproduce many of the sounds and textures on any other instrument!!! the second “Back to Bach” series begin in December. Next summer’s series begins on 9 June 2011 at 1:10pm, with recitals exploring the compositions of the organists of the great Church of Saint-Sulpice in Paris: Nivers, Clérambault, Séjan, Lefébure-Wély, Widor, Dupré, Grunenwald and Roth.